During my time blogging, I’ve had the good fortune to be able to review various tools developed by Yuzuru Jewell for use with Second Life, notably Rokuro and Tatara, both produced under his Kanae Projects brand, and aimed at supporting content creation. Yuzuru recently informed me he was working on a new tool, which represents something of a departure from his other apps – a text-to-speech conversion tool which allows chat entered into Second Life (in open chat) to be converted to speech and listened to via headphones / speakers. The tools is now almost ready for release, and Yuzuru kindly allowed me to have preview access to a beta version of the application and take it for a test drive. The app, Idobata Pro, will be available for both Windows 7 32-bit and 64-bit as a ZIP download, containing a Readme file and the program executable. No installation is required; simply drop the EXE file in the folder from which you want to use it & create a shortcut as required. However, it does require Microsoft Speech Platform 11 is installed on the PC. Once “installed”, simply double-click on the EXE / shortcut to launch Idobata. The application runs in a single window, no tabs or anything to fiddle with, and set-up is a simple matter of using the presented options. DEFAULTS – reset Idobata to its defaults. Rate: the speed at which chat is spoken. Positive numbers mean faster playback, negative numbers means a slower playback. Select whether you wish to have chat converted directly from the viewer (requires you select the viewer and avatar) or from the chat file (requires you provide the chat file location). 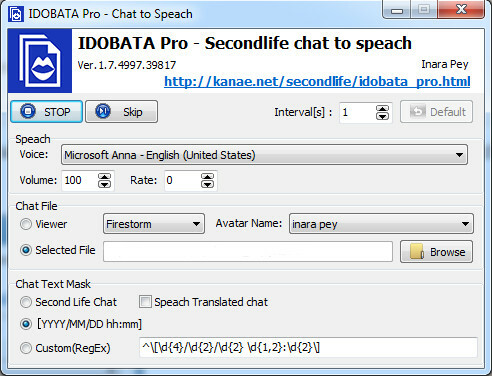 Currently, only Firestorm and Second Life are recognised by Idobata, so if you’re using another viewer, try using the convert from chat text file option. Speak translated chat – if you use translator within SL, Idobata will only read back the translated text, not the original language text. Click the START button to use the application. You’ll get a brief thank you message, which you can use to adjust the rate of playback, if required (click STOP to adjust the settings). Idobata works well, although the voice can take a little getting used to – adjust the Rate option in settings if you have problems understand what is being said. The app potentially has a lot of uses, particularly if you’re engaged in something and don’t keep track of button flashes in CHUI or things like console messages , chiclets, etc., or indeed, if you’re off doing other things. For example, I spend a fair amount of time logged-in to SL but working on other windows, and so have the viewer minimised a lot. Idobata has already proven worthwhile for me as it allows me to hear who comes on-line, so I can flick back to the viewer if someone I need to IM comes in-world without my having to constantly flick back and forth with the viewer. There are a couple of minor irritants – neither of which are Yuzuru’s fault per se. One is that Idobata has no way of determining the origins of what is being entered into chat – it simply converts everything in the channel. This means that in places where there are a lot of spammy objects, it can get a little annoying (I was at a region where a greeter bellows out every single new arrival and how far away from it they arrive; that got particularly old very quickly, both with the announcement appearing in chat and Idobata reading it back). The other is the US Microsoft Anna voice – but that’s purely personal! Idobata will be available from Monday September 9th via Yuzuru’s Kanae Projects website. The app can be used in a trail version for three days on a “try before your buy” basis, and licences for the full product will be available for L$1250 through Yuzuru’s in-world store. You know what voices would be fun to have in Idobata? Rowan Atkinson as Edmund Blackadder, Esq. and Hugh Laurie both as the imbecilic Prince George (from Blackadder the Third) and as Gregory House. Can you use the regex to limit what is spoken and hence get round your irritation? Not very user-friendly though, I agree. It also works in OpenSim (unsurprisingly). Apr 21, 15:00 PDTCompleted - The scheduled maintenance has been completed.Apr 21, 06:00 PDTIn progress - Scheduled maintenance is currently in progress. We will provide updates as necessary.Apr 15, 10:38 PDTScheduled - Concierge phone and chat support will be unavailable Sunday, April 21st. Ticket submissions will still be available at this time.